Planting a tree is a great way to celebrate Earth Day! Believe it or not, Earth Day is almost here. This year’s occasion will be celebrated on April 22. 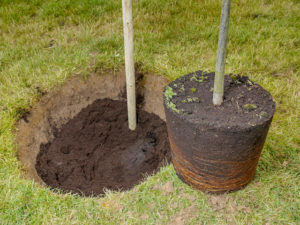 If you’ve never tried it before, then you should think about planting a new tree in your yard. Here are some tips for doing just that. First things first, think about the spot where you want to plant the tree in the first place. How much sun and how much shade will the tree receive? When considering these conditions, you’ll also have to factor in how wet or dry your yard is. After all, spring is notorious how much it rains, particularly in April. You’ll also need to account for the type of soil you have available, as different tree species will need different types of soil. The next step is to pick the tree you want to plant. For best results, find a tree that will fit in well with any woods that might be close to your home. You will be sure the tree isn’t in an environment that it is unsuited for. When it’s time to decide what tree you want to plant, consider choosing a native tree. Make sure the tree isn’t what is known as a hybrid or a cultivar tree. Find local seeds and cuttings so you know the tree will be happiest where it belongs. These trees should be between six and eight feet, which should theoretically keep them out of the reach of hungry deer. You might be surprised and awed when a deer wanders into your yard. Despite how cute they are, they can be quite dangerous to your trees and your other landscape features. Your newly-planted tree will be at its most vulnerable, so do your best to prevent deer grazing. Tree shelters work best for trees under six feet high, while tree wraps are better for trees taller than eight feet high. This entry was posted on Friday, April 20th, 2018 at 5:52 pm. Both comments and pings are currently closed.